Watching live ghost cams online is a great way to go ghost hunting without leaving the safety of your own home. These live feeds run at locations that are known to be haunted, and you can tune in with other viewers around the world in hopes of catching a glimpse of a ghost. If you see an apparition while viewing the feeds at any of the following sites, be sure to use the screen capture feature found on most sites to get a permanent record of the sighting. Willard Library in Evansville, Indiana is one of the oldest public libraries in the state, and it's considered haunted. Its Victorian Gothic architecture is the perfect setting for a haunting. The library's website has three web cams set up. All three are displayed on the same page and refresh every 20 seconds. 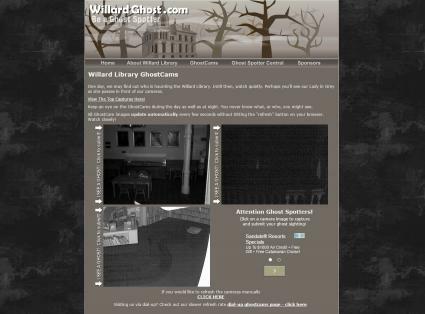 If you spot a ghost or unusual activity, simply click on the appropriate cam screen to capture a screenshot and then submit your photo to the website. Everyone searches for the Grey Lady who has been spotted in the Children's Room by many visitors and cam viewers. This area is the library's room for telling stories to visiting children. Be sure to visit the Ghost Spotter Central page for information about where the Grey Lady ghost might be and view screenshots that website visitors have captured of possible ghosts. 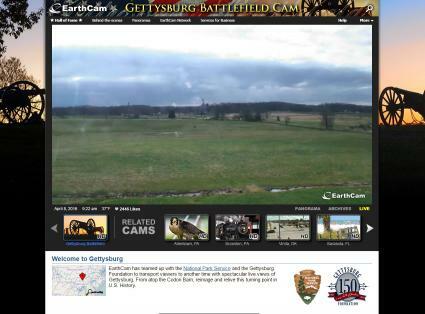 The Gettysburg Battlefield Earthcam is operated by the National Park Service and the Gettysburg Foundation. Though not an official "ghost cam," the 24/7 broadcast overlooks Gettysburg from the top of the Codori Barn, and you can watch this live feed in hopes of catching one of the many ghosts reported here. On July 2, 1863 the Codori Farm was the scene of heavy fighting. The following day, General Pickett directed what's known as Pickett's Charge from the farm buildings. While the original barn was torn down in 1882, the current barn was built in the same location. The National Park Service owns the farm with the farmhouse serving as a residence for park personnel. The farmhouse was used as a hospital for both Union and Confederate soldiers until the battle was over. 50,000 soldiers died on the Gettysburg Battlefield. After the battle, over 500 Confederate soldiers were buried on the farm but in 1872, as many of the remains that could be found were shipped to the South. It's possible some graves were overlooked. Ordsall Hall is a "black and white half-timbered manor-house" that was first recorded in 1177. Over the centuries it has served many families, including medieval gentry, Tudor nobles, an Earl, a butcher, a farmer, loyal Catholics, priests, artists and many others. 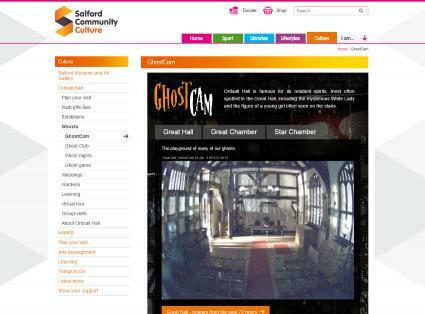 It's no wonder that, with such a vast history, Ordsall Hall is also haunted. 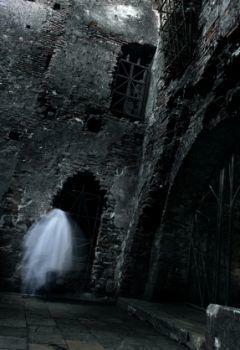 Among the resident ghosts are the White Lady and a young girl. A tourist destination, the Hall is part of the Greater Manchester Museums Group (GMMG) and underwent a 2-year restoration program, re-opening in 2011. It's open to the public five days a week year round with free admission. There are three web cams placed at the areas considered the most active: the Great Hall, the Great Chamber and the Star Chamber. Each screen automatically refreshes. Great Chamber: The White Lady resides in this bedroom. Star Chamber: This bedroom is said to be the most haunted of all rooms in the Hall. #4 Basement "Paranormal Ghost Cam"
This is a live ghost cam feed of a basement located in a private home. It is available from 12 am to 6 am CST. The website states that sometimes the cam is turned on during the day. The live stream also has a live chat window that can be opened for discussing the feed with other viewers. You can also capture a screenshot if you see something paranormal. The Shy Shadow: The web cam is set up to capture what the website calls an "elusive shadow" that is seen moving from the corners in the room. Reportedly, the shadow is shy. You may also see a cat roaming about the room. Orbs and more orbs: There is an unusual number of orbs that can be seen floating down the hall and moving across the room. Some move quickly while others seem to meander about the room. The live cam also has audio that makes it fun to watch the orbs and shadows while listening for any accompanying odd sounds. 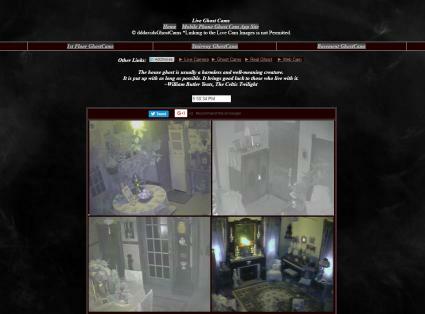 One of the most extensive web cam sites online is the mysterious Victorian house found on the dddavid's Ghost Cam website. The house is as mysterious as the owner, presumably David. He doesn't disclose where the house is located or who he is, but he does offer visitors a whopping 20 web cams set up inside and outside the house along with a few tidbits about his fellow resident. David also states that prior to moving into the home he was doing some renovations, but found it difficult. Something always hampered the project. His tools would mysteriously disappear only to reappear an hour or so later. He found that several rooms had locks on both sides of the doors. He describes the home as a "very old five-bedroom castle-like Victorian." Each room features four web cams as does the outdoor section. Rooms featured here include the breakfast area, kitchen, library, dining room and parlor. Poltergeist activity: Cabinet doors opening and "things flipping off shelves"
Rooms include the old nursery aka "The Cold Room," den and two bedrooms. Captured EVPS of children, a crying baby and "a man who did not seem to be so happy"
Four more cameras give great views of the staircase and upstairs and downstairs area. Four web cams provide several views of the basement. An additional four web cams can be found outside. These are infrared night vision cameras set up in the hope of catching some of the strange activity taking place outside the house. Perhaps the property just beyond the yard, said to be the site of unmarked graves, is responsible for much of the outside activity. Watching live ghost cameras can be time-consuming and requires a great deal of patience so you don't miss a possible apparition. While there aren't many "live feed" ghost cams, those still around are greatly appreciated by aspiring ghost hunters and those interested in the paranormal.